I want to update my Payment Declined msg but can't view the Preview. I've also tried it in an Incognito browser window (Chrome) and Internet Explorer and FireFox. Would not work in any of them. I left the browser window open for 10+ minutes (seriously) and it finally loaded. Sorry about that! I was able to replicate this on my end, so I'll go ahead and ticket this so our engineering team can have a look. In the meantime, you should still be able to see what your emails look like by sending yourself a test email. 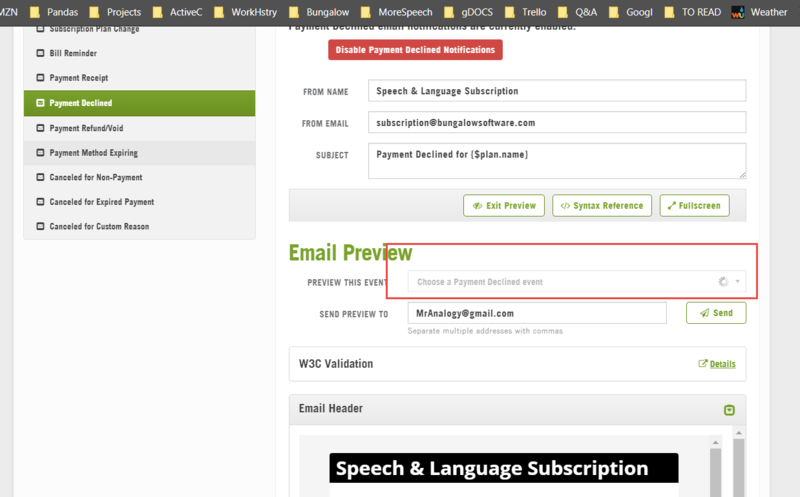 If you send a preview to yourself without selecting a specific event, you'll receive a generic version of the email type that uses some default customer details. Hopefully, this will help you with your updates while we investigate this issue. Our engineering team just deployed a fix for this issue, so you should be able to preview previous events quickly and easily now. :) Let us know if there's anything else you need! The Cheddar staff are involved and working on the issue.